The design concept was based on a series of superimposed screens, creating a layered effect against a blank brick wall. The outermost ‘layer’ is a structural gridded screen made of weathering steel. The second is a weathering steel-framed glazed façade of museum quality UV-treated glass, which opens to allow natural ventilation. Inside the extension, two additional layers hang from each storey’s ceiling: red blinds, which protect the collection of artworks, and the weathering steel display screens that showcase the collection. 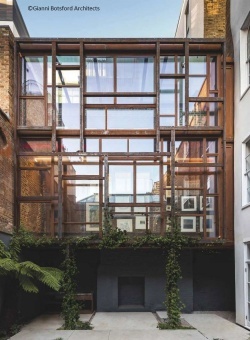 The dendritic façade of the gallery is supported by the visible structural weathering steel frame on the building’s exterior. Made from flat stiffened plates branching out over the three-storey structure, the entire frame is supported off just two 120mm x 12mm steel posts with a stiffening rib on the rear face, creating a T-shaped section. In a reversal of the usual structural hierarchy, this façade is also the main structural frame of the gallery, supporting all the floors and roof as well as providing lateral stability. Around 25 steel members make up the façade, each falling into a family of just three sizes: 120mm, 100mm and 70mm wide T-sections - all fabricated from flat weathering steel plate. At the upper storey, the steel members also wrap over the top of the extension and support the glazed ceiling, ensuring a coherent structural system and aesthetic for the entire extension. Thoughtful connection design and careful detailing were key to the building’s success. 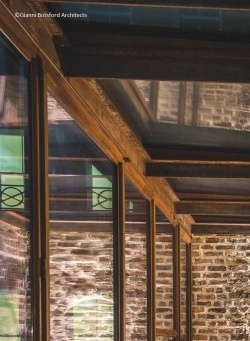 As the façade is the structural frame and, therefore, outside the building envelope, the floor beams, which connect to the façade, are detailed with a thermal break at the glazing line. Further, the numerous connections (45+) were each carefully coordinated to ensure ease of assembly between the members, and were detailed to conceal many of the bolts which are countersunk into the plate. Steelwork Contractor Trescher Fabrications Ltd.
Main Contractor Verona Construction Ltd.